Good morning, Everyone! Just wanted to say a quick hello and share a few images of my old and new obsessions. I've been looking for a plaid coat for some time now, so, when I spotted this amazing one from TOPSHOP, I knew I finally found it! 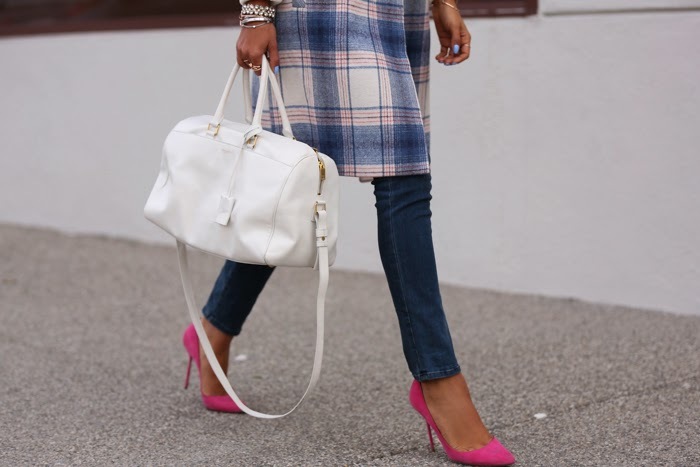 I mean, pastel + plaid, what else can a girl ask for! :) You may have also noticed, I developed a weakness for rose gold lately, and the pieces I am wearing in this post are definitely my current favorites! Although I think rose gold looks great on it's own, I like to pair it with silver jewelry. I think that because rose gold jewelry looks so pretty and feminine, combining it with simple silver pieces makes the armparty look more modern and edgier. How about you guys, how do you feel about rose gold?